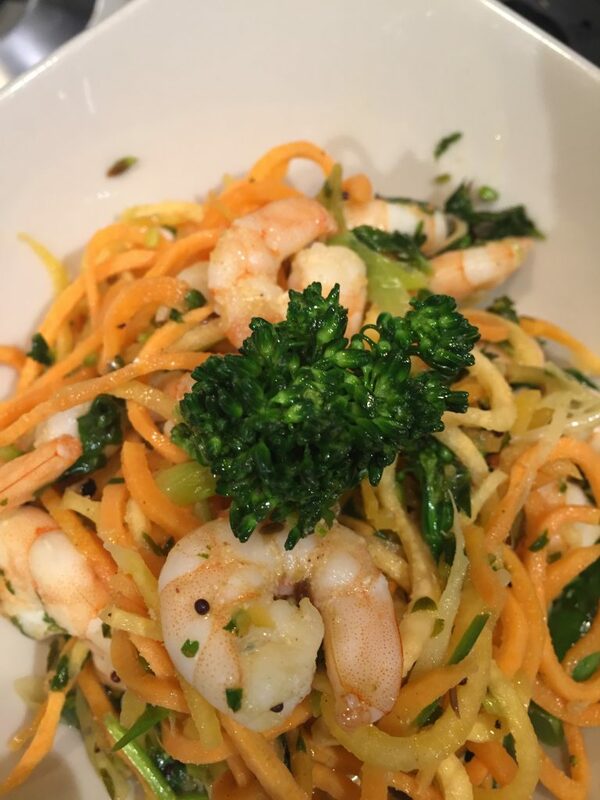 I thought I was running out of ideas for how to cook sweet potato, until I pulled out the spiralizer from the back of the cupboard, so the sweet potato and prawn stir fry transpired. I’ve learned to work backwards when doing a stir fry, by this I mean the hob and wok is the last place for the ingredients to reach. The preparation is everything here. 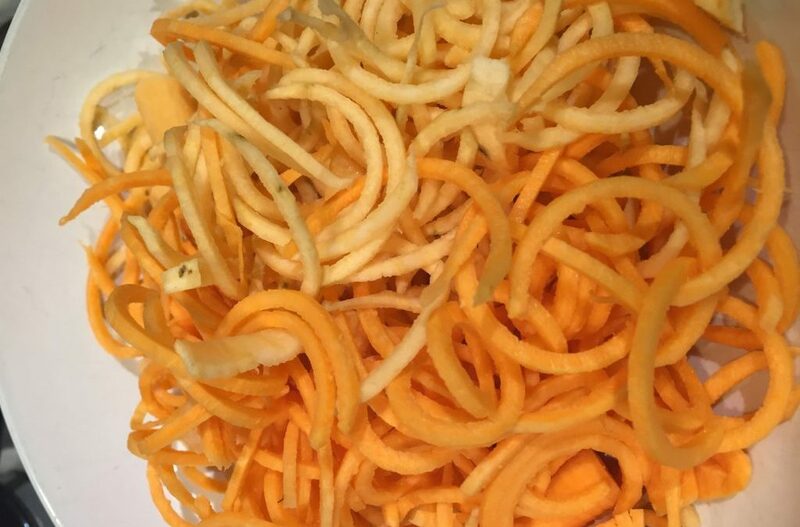 So the part which is the most laborious I tackled first– peel and spiralize the sweet potato – I used 2 small sweet potatoes for this recipe. Then I moved onto the garlic – 4 cloves peeled and sliced, chopped up a small piece of ginger and 3 spring onions along with 3 stems of tender stem broccoli. At this point the ingredients are ready for the wok. The wok went on a high heat, with some coconut oil and mustard seeds, wait until they start popping – be careful they tend to fly everywhere! The ingredients were added in the following order: garlic, prawns – cook until the prawns are almost done then add broccoli, ginger, chilli, spring onions – season with some salt/soy sauce, and garam masala. Stir through the sweet potato towards the final stage, as it only needs a few minutes to cook through. Once everything is cooked through, squeeze the juice of 2 lemons into the stir fry with a handful of chopped coriander. Size 20-16 … The New Skinny Me way!! "I found Amrit to be thorough, clear and direct in her approach to personal training. She always pushed me forward towards my personal goals and gave me heaps of encouragement when I achieved them. Her deep tissue massages really helped to ease my muscle tightness and helped me refocus on the areas I needed to work on more." "Because Amrit’s Sports massage proved so effective for me I have already recommend Amrit to various friends and even my whole cycling club." "Another fantastic SheLIFTS from Amrit K Theocharous this evening, really built on the moves from last week – with much more lifting this time – my arms feel like spaghetti now!" "Amrit has been instrumental in getting my fitness back on track. Fat is melting away every week and there are great new layers of muscle everywhere; I’ve really never looked or felt better. She is an excellent motivator and teacher, always eager to find out what will work best for me. I can’t recommend her highly enough. Thanks Amrit!" "Amrit has helped me significantly with a few issues with my back, neck and shoulder. I go through intensive training periods and it is important for me to be fully functional. Amrit is very skilled and knowledgable, not only does she alleviate the pain but she also works with me in identifying how the problems are caused and how to prevent them. Highly recommended." "Highly recommend Amrit’s Shelift class. Strengthening and conditioning-An excellent way to start the week." "I just wanted to drop you a line to thank you for your 1-2-1 Personal Training over the last 4 months. As someone who was an exercise avoider, I surprised myself by enjoying strength training. I have lost 19inches in total and have a new found respect for my body and its abilities. I felt I was in such safe hands with you and I even have my own foam roller now. Thank you for your time, patience and wealth of knowledge in helping me transform my life." "9.30 class with the Amazing Amrit and the “She lift” girls…. Amrit you are a such a star motivator, and made every moment feel so achievable, and in the words of a He Lifter….”I`ll be back”!!!! so energised, I can`t wait for next Monday!" 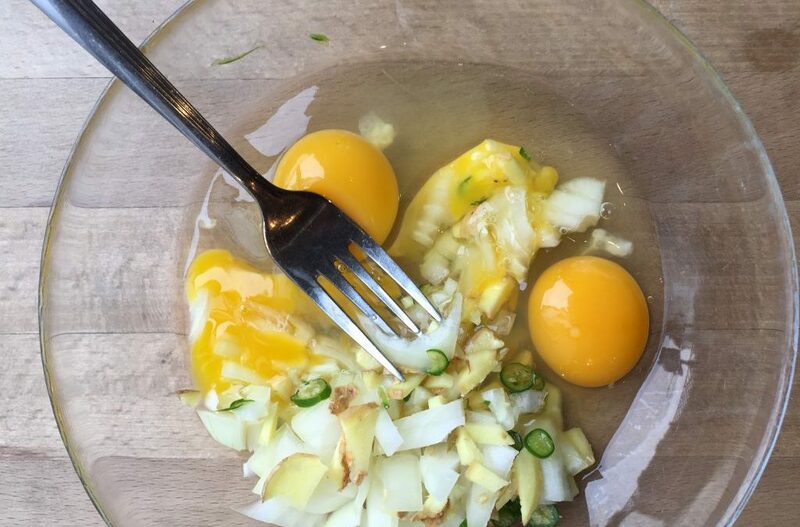 The 5 minute omelette – came about when I literally had 15 mins to cook, eat and wash up before my next client arrived! So I started warming up the pan with some coconut oil, then threw 3 eggs into a bowl and added one chopped onion, green chilli and ginger. Seasoned with salt and garam masala. Whisked it all up and poured it into the hot pan then let it cook through. I teamed this lusciousness up with some tomato, avocado and my beautiful sauerkraut! This was devoured within 5 minutes – it definitely hit the spot!! Stay tuned for more quick and easy power lunches. I was caught out unprepared, all my batch cooked meals had been eaten, rushing around between work, home and the school run, I had to throw something together for a spot of lunch. 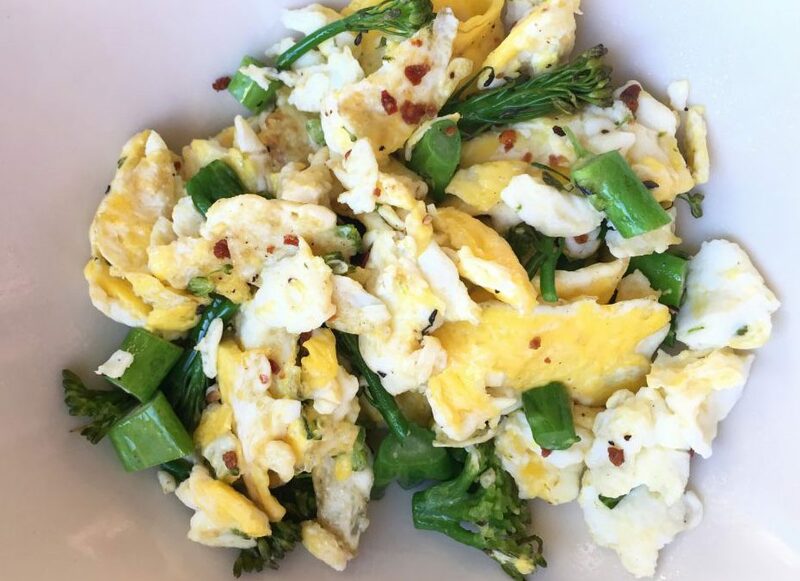 There’s always a box of eggs in the fridge, so I simply scrambled 2 eggs with some chopped up tenderstem broccoli – seasoned with some black pepper and red chilli flakes – lunch was ready to eat in under 5 minutes, and devoured within a minute. A few minutes of peace over a cup of green tea and I’m ready for the school run.